For those betting boxing, Jermain Taylor shocked the boxing world by defeating Sam Soliman via unanimous decision for the IBF middleweight title in Biloxi, Mississippi. Despite being a 3:1 underdog against Soliman just several days ago, Taylor looked better than most expected him to against his super tough Australian opponent. 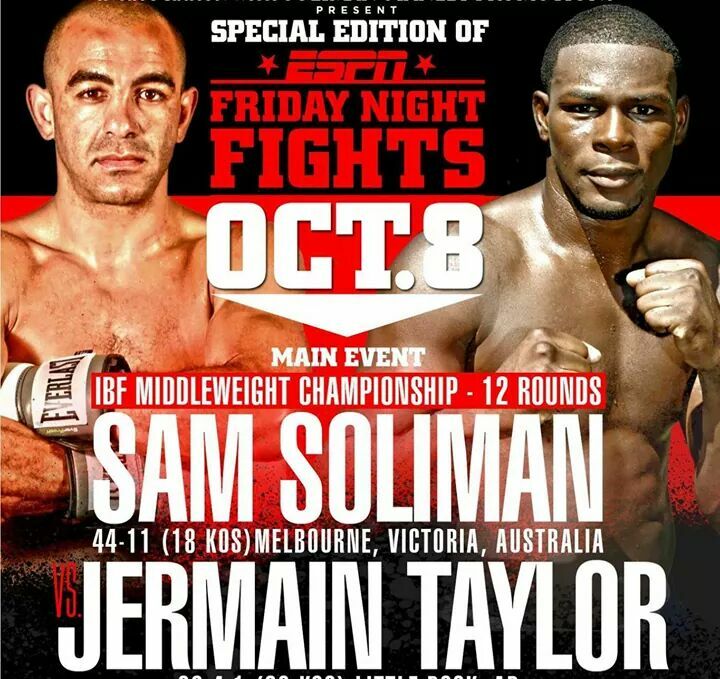 Sam Soliman (44-12, 18 KO’s) apparently injured his left leg in round 7 when he was barely grazed in round seven by “Bad Intentions” Taylor and knocked down. Jermaine would go on to score grazing knockdowns in rounds eight, nine, and eleven as he started coming on strong later in the fight. Although Soliman was winning the earlier rounds, the moment he injured his left leg was the moment that Taylor took command of the fight. Truth be told, it was an ugly fight with lots of holding and clinching by Soliman who was off balance all throughout the boxing event. And Jermain Taylor (33-4-1, 20 KO’s) did just enough to earn the win. Had Soliman not injured his leg, we have no doubt that he would have easily outpointed Taylor in a 12 round snoozer. “Kid Chocolate” Peter Quillan was in attendance for the fight and expressed an interest in a future showdown with a “top name” opponent without officially naming anyone. The middleweight division looked pretty stacked with Quillin, Miguel Cotto, Gennady Golovkin, Marco Antonio Rubio, and now Jermain Taylor all in the miz. Who should Al Haymon have Taylor face next? Is Taylor ready to be a big part of Showtime boxing being that he’s managed by Haymon? Or will he remain on ESPN boxing since his skills are nowhere near what they once were? Please share your comments below?